Most generally any neurons which are not motor or sensory. 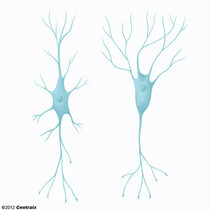 Interneurons may also refer to neurons whose axons remain within a particular brain region as contrasted with projection neurons which have axons projecting to other brain regions. INTERNEURONS of the vertebrate RETINA. They integrate, modulate, and interpose a temporal domain in the visual message presented to the RETINAL GANGLION CELLS, with which they synapse in the inner plexiform layer. INTERNEURONS of the vertebrate RETINA containing two processes. They receive input from the VERTEBRATE PHOTORECEPTORS and send output to the RETINAL GANGLION CELLS. 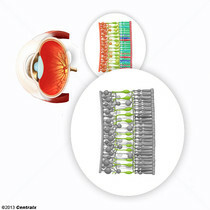 The bipolar cells also make lateral connections in the retina with the RETINAL HORIZONTAL CELLS and with the AMACRINE CELLS.